HISTORY OF THE DEPARTMENT The department of Botany was established in 1958. Post-graduation in Botany was started in 1971, with specialization in Plant-Pathology. In 1990, two more specializations i.e. Microbiology & Phycology were added. At undergraduate level Microbiology was initially started in combination with Chemistry & Zoology under self-financing scheme in1999. This combination was later changed to Chemistry; Microbiology and Botany. The department is running post graduation course in Microbiology since 2002. 3-months certificate course on instrumentation and Bonsai. LIBRARY : Department has separate library for Botany & Microbiology, with sufficient number of books for P G students. The books are well classified under different heads such as – General Botany, Microbiology, Cytology, Physiology, Taxonomy, Genetics, Ecology, Plant Pathology etc. Recommended by Central Board of Studies and approved by HE the Governor of M.P. Sir Jagdish Chandra Basu activity club performs various activities throughout the year. One-day workshop on Bonsai Preparation. State level Environmental Awareness Examination was conducted. Guest lectures on special topics by eminent persons. DEPARTMENTAL MAGAZINE : Annual departmental magazine titled “HARITIMA” and "Microbial World" is being published with the contribution of students, staff & other persons from various institutes. Regular visits to S.F.R.I., T.F.R.I., and J.N.K.V.V. Jabalpur, and outstation trips are organized every year to places like Fossil Park (Ghughwa), Amarkantak & Pachmadi . Farewell of Dr. Vijiya Shrivastava. 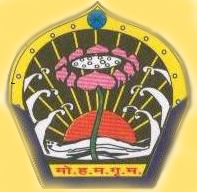 Photo of M.Sc. Students 2009-10.